Learning how to connect letters to form words, and then segment words is not easy. However, with a few effective strategies, your kids will be begging to practice segmenting words. Before children will have the ability to segment words, they need to practice putting letters together. While most of us are fairly confident in helping our kids form words, we are generally guilty of not focusing that same amount of energy on teaching our kids how to break apart those same words. By teaching them to put words together and break words apart, we are equipping them with the ability to understand the mechanics of words. This skill will serve them well as they later learn how to read multi-syllabic words (or words that have many syllables). 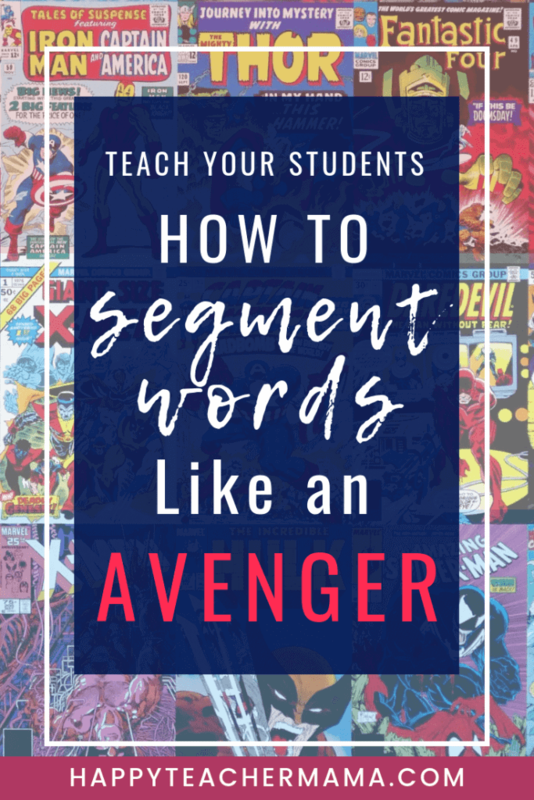 There are many ways to separate words, but today, I’m going to give you 4 strategies that will help your kiddos learn how to segment words like an Avenger! In all likelihood, you’ve heard the phrase “Hulk Smash” in some form or fashion. This is what the muscle-bound green giant says when he plans to put the smack down on something. So, why not put the smack down on words? With your fists together, pull your right fist to the right of your body, saying the /c/ sound. Then pull your left hand to the left of your body while saying the /a/ sound. Finish with the /t/ sound by “Hulk smashing” your fists back together in front of your body! Following the same interactive movements as the beginners, start with fists pointing together. Pull the right fist to the right side of your body and say /e/. Then pull your left hand to the left side of your body and say /le/. For the last syllable, bring both fists back together and say /phant/. Wonder Woman is an Amazon, and with that birthright brings unique powers. She wears the “Bracelets of Submission” which are meant to protect her by deflecting bullets or other rogue weapons. And since Wonder Woman happens to be my favorite superhero (of all time), I had to include her! For this interactive strategy, we are using the word “cat” again. Start with your hands in fists by your side. Bring one hand up bending at the elbow and say the /c/ sound. Bring the other hand up bending at the elbow and say the /a/ sound. Finish with the /t/ sound by crossing your fists at the wrist. Using the word “elephant” again, let’s break this word into syllables. Bring one hand up bending at the elbow and say the /e/ sound. Bring the other hand up bending at the elbow and say the /le/ sound. Finish with the /phant/ sound by crossing your fists at the wrist. For these first two, I’ve used a three letter word and a word with three syllables to match the Avengers actions. You can easily modify this to suit the number of letters or syllables in the words you are having your students practice. If you know anything about the Avengers, you know about Captain America. He has a shield that is made of Vibranium which is supposed to be the strongest element in the universe. Therefore, his shield can protect him from ANYTHING. So, let’s get our kids to pretend to use their shields! With your hands in fists by your side, bring your right fist up bending at the elbow and say the /d/ sound. Turn your fist toward your left side and punch your fist across your body as though covering yourself with a shield and say the /o/ sound. Bring your right fist back toward your right elbow and say the /g/ sound. Finally, push your fist back toward the ground and say the /s/ sound. This will put your arm back into the originally position. With your hands in fists by your side, bring your right fist up bending at the elbow and say the /al/ sound. Turn your fist toward your left side and punch your fist across your body as though covering yourself with a shield and say the /li/ sound. Bring your right fist back toward your right elbow and say the /ga/ sound. Finally, push your fist back toward the ground and say the /tor/ sound. This will put your arm back into the originally position. Ok. So technically, Thanos is a super-villain from the movie “Avengers: Infinity War.” But, you can’t really have superheroes if you don’t have super-villains to fight against. As the ultimate super-villain, Thanos obtains the holy grail of all weapons…the Infinity Gauntlet. At the snap his fingers, he has the power to eliminate half of the universe’s lifeforms. So, let’s use our snapping ability and see what we can with words! We will use the word “dogs” again to introduce this strategy. The only motion required for this is the ability to snap (or make some semblance of a snapping sound). Give these a try and let me know what your kiddos think by leaving a comment below!